Blues? Definitely, infiltrated with a dark tinge of grey. These are not sunny days regardless of the bright cover, for the songs visit every crossroads in the book. Successful perhaps, but Plant's had bad luck equal to the most hard done by 1930s Delta carriage hitcher, and it shows. He's earned the right to sing this stuff. Bukka White's 'Funny In My Mind' is familiar Plant territory, retreating to the hell-bound source of many a Led Zeppelin lyric theme, as does Jesse Colin Young's 'Darkness Darkness'. Classic textures of old are revisited in the cover of Moby Grape's 'Skip's Song' which sounds like a lost gem from Led Zeppelin II. Subtle overtones of the Middle East unobtrusively compliment this collection in a manner reminiscent of his greatest '70s work. 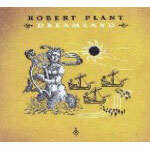 Plant was born to make the Zeppelin albums and I would now add 'Dreamland' to that list. This fatalistic rendering of William Robert's 'Hey Joe' sends a shiver up the spine. Introduced by tastefully combined sampled loops and haunting synth arpeggios, it eventually slams into and right through a brick wall, on a mission that missiles beyond grunge torture, reinforcing the message in a way even Hendrix's classic version would now fail to live up to. Sitting rather uncomfortably here is Bob Dylan's 'One More Cup Of Coffee'. It's fine, but belongs on another album and the sentiment comes off a bit lame amongst the utter hopelessness of the surrounding lyrics. Did I actually say that? Not Dylan's fault. Wrong song choice is all. But who would've wanted a megastar producer to step all over 'Dreamland'? Overall, Plant's done a fine job on this largely self-produced milestone and I recommend it to any hardened blues addict. There's more angst-ridden emotion here than the average virtuoso-defined album by any late 20th century blues great and it took a chap from Staffordshire, England to do it. How 'bout that?